On a steep downhill slope moving off in second gear instead of first gear will give a smoother start. Put your right foot on the brake, not the accelerator. Come up towards the biting point. Ease off the brake pedal. As the car rolls forward, apply some power and release the clutch slowly. Leave your steering wheel turned to the kerb. 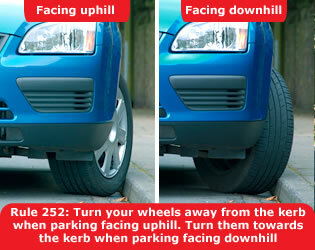 the kerb should stop any forward movement. Leave the vehicle in reverse gear with the parking brake firmly applied. Parking on a slope is more difficult than parking on a flat. You should leave a bigger gap to allow extra space for manoeuvring. This will help both you and others.